Finding information should be as simple as using a great product. 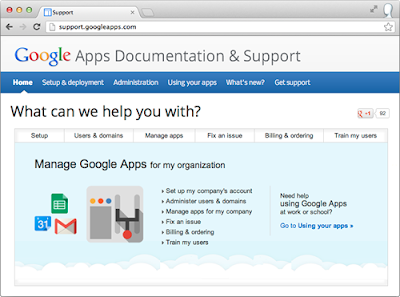 That's why we created support.googleapps.com—an easy-to-use website where you and your employees can find everything you need to make the most of Google Apps in your organization. In addition to 24/7 phone support, we now offer a complete collection of documentation, training, and self-help resources available at one convenient location. You can visit the site whether you need to set up a new app, troubleshoot a calendar issue, train your users, or talk to a support rep.
You and your employees can go to the Using your apps section of the site to find helpful information tailored specifically for using Google Apps in the workplace. Here, you’ll find guides on switching from your old email program to Gmail, calendar tips for administrative assistants, steps for setting up mobile access or a shared inbox, and other essential information for business users. Visit the What's new? section for a schedule of new Google Apps feature and product launches. You’ll not only learn about important updates like the release of Google Drive or the new Gmail compose experience, but you can get tips and training resources for rolling these changes out to your users. [Google believes] that good support is a core component of Google Apps and [hopes] that by placing these resources at your fingertips, everyone in your organization can find helpful answers, solve problems, and learn new ways to benefit from Google Apps. 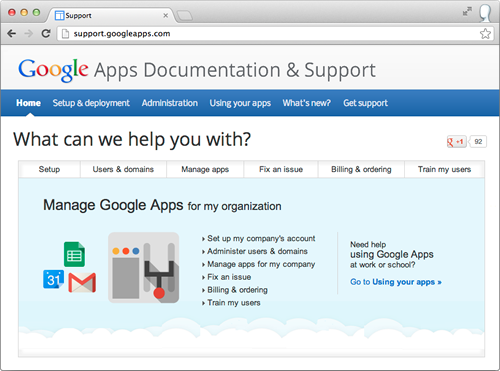 Check out the new site now at support.googleapps.com. Enjoy!